A: LionJobs is the UNA Career Center's Online Employment System. All internships, part-time jobs and full-time jobs are posted to LionJobs. It is required that all on campus jobs be posted to LionJobs. Q: How can I find my username? A: If you have forgotten your password, please go to career.una.edu/LionJobs and click on the "Forgot Password" option. You will receive a new password in the inbox of the e-mail you used when setting up your LionJobs account. It takes about five minutes to receive the new password. If you h ave not received the password within five minutes, CHECK YOUR JUNK FOLDER. If it is not in your junk folder, please call our office at 256-765-4276. 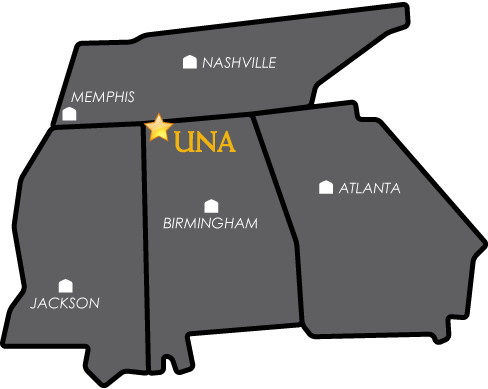 Q: Do I automatically have a LionJobs account set up for me when I have been accepted to UNA? A: No. All students must create a LionJobs account once they have applied and been accepted to UNA in order to use the system. Q: Who can use LionJobs? A: LionJobs is strictly for current UNA students and alumni. Q: How do I get a resume, cover letter, and other documents approved in LionJobs? A: Log in to your LionJobs account, click on "Documents" and "Add New." Please make sure you choose the correct title of your document. For resumes, choose "Resume." For cover letters, choose "Cover Letter." And for departmental applications, transcripts, schedules or any other documents, choose "Other Documents." The documents you upload will be approved within 24-48 hours after you have submitted them to LionJobs unless you submit them on a Friday, Saturday, or Sunday. Q: Why do I not have the option to submit my departmental application when applying for a position? A: You may not have saved your departmental application as "Other Documents." If you saved the departmental application as "Resume" or "Cover Letter," you will not be able to upload it to the position for which you want to apply. Please resubmit your departmental application as "Other Documents." Q: Why did my resume get disapproved? A: The Career Center staff want to make sure that your resume looks its absolute best before you submit it to an employer. If your resume was disapproved, please check your email for the reason why and to review suggestions given for improvement. If you do not see the reason why, please call 256-765-4276 for further assistance. All seniors are encouraged to meet with someone in the Career Center before graduation to receive one on one assistance with their resume and other application materials. Q: Can I add additional documents once I have applied for a position? A: No. Once you click "Submit," you are unable to attach any other documents. Please make sure you have submitted all required documents before clicking, "Submit." Some employers ask for additional documents to make sure that applying students know how to follow directions. READ all the instructions for each position before you apply.